These little cheesecakes would be a fabulous recipe for children to make. 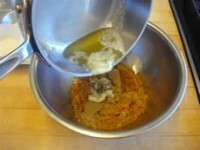 To make the crumbs for the crust they can put cookies in a plastic bag and hit is with a wooden spoon. Rather than canned pumpkin, I used cooked yam. Just bake a pricked yam in a 350 oven for 35-40 minutes and peel. I found that these little cheesecakes keep well even with the cream topping overnight in the fridge—that is if you don’t keep eating them! Preheat the oven 375 degrees. 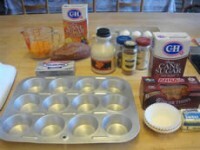 Line 12 muffin cups with foil liners. In a medium bowl, combine the crust ingredients until they hold together when squeezed gently in your hand. 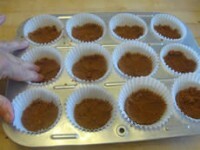 Divide the mixture between the muffin cups, pressing it firmly into the bottom and slightly up the sides of each one. 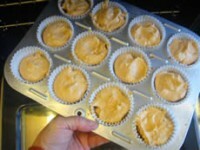 Place the muffin pans in the freezer while preparing the filling. To make the filling, combine the cream cheese and pumpkin in the bowl of an electric mixer fitted with a paddle attachment. Beat well on medium speed until very smooth and no lumps remain. Add the egg, egg white, brown sugar, syrup, cinnamon, ginger, and nutmeg and continue mixing until well combined and totally smooth. 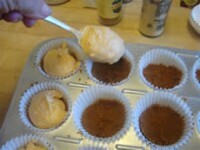 Using a small ladle or a spoon, divide the mixture between the muffin cups. Place the pans in the oven and bake until just set, 12-14 minutes. Transfer the pans to a rack and let cool completely. Cheesecakes can be refrigerated, covered, up to 2 days. Just before serving, beat the heavy cream until it just hold soft peaks. Add sugar to taste and the vanilla and beat until just combined and fluffy. 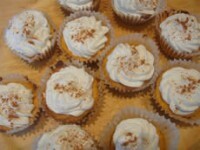 Serve the cheesecakes topped decoratively with the whipped cream and, if desired, a sprinkle of cinnamon.